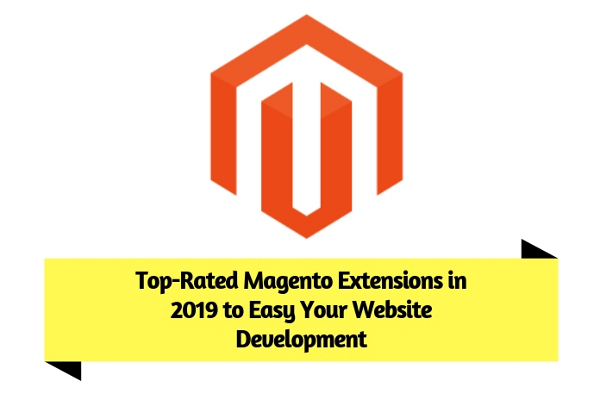 Top-Rated Magento Extensions in 2019 to Easy Your Website Development - GoodGuysBlog.com - New, Technology, Marketing, Health and So on. Do you own an e-commerce website or thinking to create the one? Then, you must need top Magento Extensions to increase your sales and enhance customer experience. A Magento Extension is a collection of best methods that add extra functionalities to Magneto E-commerce Store. Finding the best and the right Magento Extensions from thousands of extensions is a very burdensome task. So, here we are with the top Magento Extension Development for your website. Contact Form Builder Flexible form is one of the top rated Magento Extension. It is easy to use with a number of forms and field creation. If you want to build a good communication with your customers then, this extension is the best way to remain in touch with your customers. It has customization feature which help the customer in changing the contact form as the user want. It is also used to provide feedback for products or services. Do you know you can build a beautiful one-page interface without writing a single line of a code? Yes, this is possible with Slider Revolution Magento Extension. This is not just for running slider on the homepage. The Blog- Magento Extension- Slider revolution comes with plenty of pre-made examples, complete with all assets and sample data. It has features like drag and drop slider, navigation, designer etc. This extension can be used for both- Magento 1 and Magento 2 platforms. The emails are a very important part ofthe online business. They convey valuable information to the buyers and customers about the product. With the help of this extension, customizing email in a straightforward way becomes easy. Through this, you can get a considerable amount of customer engagement with high-efficiency emails. This extension also is available to use for both - Magento 1 and Magento 2. In an online store, it has become mandatory to have a live chat option. It helps the customers in decision making and clarifying doubts to increase sales. This is the best online feature and is the mandatory Magento extension to be included in your e-commerce store. This extension helps you to create as many custom forms as you want without any coding experience. Contact Form Magento 2 Extension provides solutions with frequent contact requests. The user can create virtually any type of contact form like quotation form, customer satisfaction survey and many more with the simple drag and drop builder, wide selection of different form fields, front end themes and design and display options of this extension. For secured online transactions, the Mobile shopping cart is considered as the best option for e-shop. It provided added advantage to the buyers and the customers of protection of personal financial details. This extension is supportable to all kinds of payment cards. Bargaining!! Yes, customers love bargaining. So, you can say this is one of the best Magento extensions for an e-shop. It motivates customers for more shopping and also for negotiation of the price. This extension is very effective and also used by the ones’ who hire Magento developers to motivate customers to shop more. Blog Magento Extension is considered to be the best extension as it provides blog creation feature with a variety of added advantages. In blog creation feature, it provides post, comment, author, tag, search features as WordPress offers. This is SEO-friendly Magento blog extension and offers different types of sidebar options to manage sidebar. In this extension, admin can dynamically enable or disable comments and social media from the configuration. Everyone is in hurry and don’t remember the delivery dates of their products. So, if you don’t want to disappoint your customers and make delivery of the products on time, then Delivery Date Scheduler is the best way. With this extension, the customers will be able to decide their preferable time of delivery. It is a Magento Mobile Application extension specifically designed for e-commerce for the customized mobile app. You can also offer user-friendly experience to the customers on iOS and Android platforms. You can also provide options like product reviews and notifications for customer and admin. This extension allows users to check the availability of products shipping, cash on delivery, and delivery information using zip code/ postcode. It becomes very easy to check the shipping details of the product using Shipping Availability Magneto Extension. If the product is available for the entered address, the customer can easily proceed to the checkout process. The availability will be displayed to the users who are logged in. Managing Search Engine Optimization for a big E-commerce Store is quite a tedious task. Handling SEO with SEO Hub will surely going to help you in managing SEO of your website. It enables you to manage Metatags, data feed, URLs and much more. It also offers some value-added features like setting the number of products on which template can be applied. Using this extension, you can ensure your e-commerce website to score high in search engine rankings. How to Choose the Best Magento Extension for You? Evaluating the right Magento Extension development is still very daunting. Even the most popular plugins have few reviews. So, here are few criteria to decide the Best Magento Extension for you. Free extensions are most likely to be used by the customers. But most free extensions also require a subscription to use. So, calculate total cost before choosing the extension, including expenditures for the time taken by developers to maintain extension. The Magento Extension you choose should be regularly updated. Look for the extensions with recent updates and additional features and bug fixes. Your extension should have excellent installation document and user guides. When choosing an extension, check out their support information. Evaluate how responsive and helpful the extension is before buying. From the available extensions, the following Magento Extensions are must-have for any online store. It enhances its functionalities and increases the conversion rate. You can post freelance jobs to hire Magento developers to install them on your online store. These Magento extensions will help you to make a remarkable e-commerce store in 2019. Also, before purchasing any extension, read different reviews and testimonials given by the customers for the extension. Always keep in mind the demand of current e-commerce business when buying an extension. Nishant Desai - Digital Marketing Strategist at Pixlogix Infotech Pvt. Ltd. I love to write about the latest trending updates, WordPress, Web Design, SEO and other interesting information. I believe in Learning, Sharing and keep growing together.